Hot on the heels of recent news that an episode of Come Dine With Me was being filmed in Worcester Park, the daytime TV crews have been in town again. 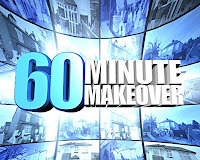 This time it was an episode of ITV daytime show '60 Minute Makeover' bringing their own brand of makeover magic to a deserving resident of Washington Road yesterday. Tranmission date has yet to be confirmed, but I shall let you know when that episode is due to hit our screens. With Location Location Location already having featured Worcester Park, that completes a TV hattrick for KT4.